The after images are significantly dimmer and show exactly where power has still not been restored, including airports and hospitals. Nasa created these composite pictures to help rescue and repair workers deploy supplies where they are needed most, something that is made even more difficult by destruction of communication lines. The pictures were taken by Nasa’s Suomi NPP satellite – one before the hurricane hit and several after. The after image is a composite of September 27 and 28, taken a week after the hurricane hit. Scientists from Nasa’s Goddard and Marshall space flight centres used raw pictures from two nights to create the image and excluded cloud cover, moonlight and other non-electrical light sources that would not accurately represent power outages on the island. 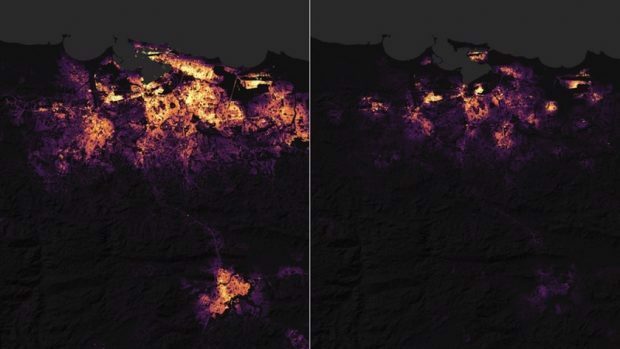 By overlaying this data with high resolution images of the actual streets, Nasa can help emergency workers co-ordinate their relief efforts to particular areas. Even before Hurricane Maria hit the island on September 20, Puerto Rico’s communications and electricity structures were already struggling after a decade of recession. 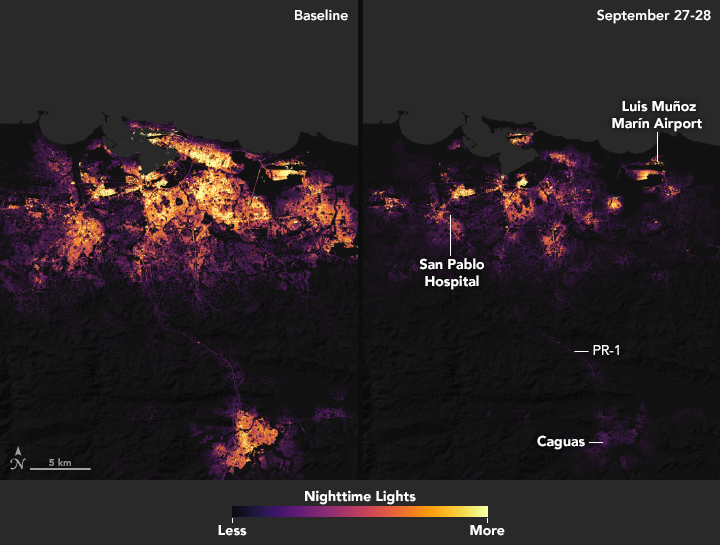 The hurricane knocked out Puerto Rico’s entire electricity grid for a period and almost two weeks later, 95% of those on the grid before still do not have access to electricity. You can take a closer look at the interactive maps of the island here.